Filippone and daughter bring hemp back from the era of our forefathers to modern day. EnviroTextiles LLC (ET), a woman- owned business, is credited with developing, importing and selling hemp fabric for scarves sold by the Obama 2012 Campaign. 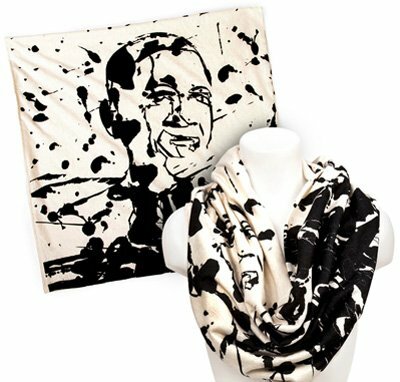 The scarves are a fundraising item for sale on http://www.BarackObama.com and were designed by one of the first lady’s personal designers, Monique Péan. Barbara Filippone and daughter Summer Star Haeske of EnviroTextiles, provided the Obama Campaign and designer Monique Péan with the special fabric.The $95 eco scarf is made of 55% sustainable hemp and 45% certified organic cotton, a soft and lightweight flowing jersey knit. Monique Péan designed and organized the printing, and each scarf was cut and sewn in the USA! Every day, more and more Americans discover the benefits of hemp. This ever-expanding market includes more products to be made from a single plant then ever documented. But despite hemp's growing popularity, an outdated and misguided federal policy – created in the 1930's – currently prevents U.S. farmers from growing this nutritious, versatile, and eco-friendly crop. “It is time for federal policy on industrial hemp to reflect today's reality and to enable a bountiful plant like hemp to be grown domestically for the benefit of families and farmers, the economy, and for the ecology of the planet. Hemp is not marijuana. It is a close cousin (variety of cannabis) but there are no psychoactive properties in the industrial versions; no different than the controversy around poppy seeds.” adds Filippone. EnviroTextiles is a pioneer in the development of hemp and hemp blend textiles as well as other natural fiber products, and is the industry leader in the efforts to improve corporate responsibility and transparency in manufacturing processes and labeling. Filippone is considered a leading developer in hemp textiles and numerous other natural fiber products. Barbara Filippone was the first person to work directly with the Chinese starting in 1994 to design and standardize hemp- based fabrics and was the first importer of Chinese hemp and organic blends. Donna Karan, Ralph Lauren, Yves Saint Laurent, Versace, Calvin Klein, Derek Lam and even Volkswagen, MTV, and Hollywood production studios source their hemp textiles from Colorado- based EnviroTextiles. EnviroTextiles provided sustainable products to over 65 countries in 2011, all out of their US facility. If you'd like more information about this topic, or to schedule an interview with Barbara Filippone or Summer Haeske, please contact us at (970) 945-5986 or e-mail Summer at Summer@EnviroTextile.com. Visit EnviroTextiles July 12, 2012 at the Fashion Institute of Technology in NYC, for the Sustainable Fashion: Fiber to Fabulous! Symposium. Obama Campaign Hemp ScarfThe Obama campaign selected Envirotextiles hemp fabrics for their eco-scarf.